On to a bigger racing adventure. Coming from a successful season in single seaters, Daniel Miranda is returning to race touring cars but this time on an international scale. 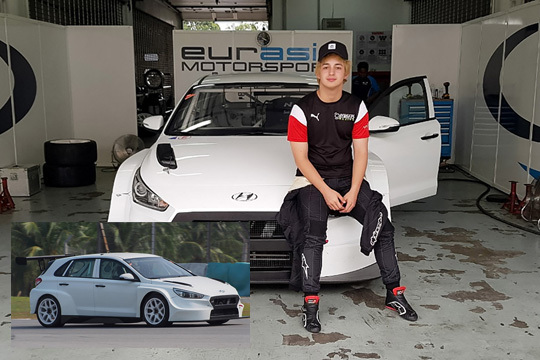 The 22-year-old driver from Cebu has confirmed his entry in the TCR Asia Series with Eurasia Motorsport where he’ll be driving a Hyundai i30 N TCR this 2019. Miranda already has a long list of accomplishments in motorsports. He started his career in go karts and was awarded Karter of the year in 2013. This was followed by the Toyota Vios Cup title in 2017 with Team Obengers before making the switch to single seaters. Last year he achieved a podium finish on his Asian Formula Renault debut and was crowned vice-champion in Formula V1. Backed by Cebuana Lhuillier, Miranda is re-united with his AFR team to enter the asian touring car series. Together they’ll compete in the full five-round TCR Asia Series championship that will take them to circuits in China, Korea, and Thailand, with the season opener this coming April 5-7 at the Sepang International Circuit in Malaysia. Miranda recently completed a three-day test at Sepang to familiarize himself with his new machine. He was able to consistently improve at every session, working on his driving style, adjusting to running on full racing slicks, as well as acclimatizing himself to the hot Malaysian weather. “The engine is fast and the car feels amazing. It has a lot of grip is a lot of un to drive. We’re now on pace and I’m excited for the first race of the season. Our target is to get on the podium and hopefully bag the title at the end of the year,” he added. The Hyundai i30 N TCR is already a race-winning package out of the box and propelled Gabriele Tarquini to the World Touring Car Cup (WTCR) title in 2018. It’s powered by a 350 hp 2.0L turbocharged 4-cylinder engine with a six-speed sequential gearbox and fitted with adjustable dampers, and Brembo brakes.